This week's Hearthstone tavern brawl rewards players with a prize that they can't actually open until Un'Goro's official release date. This week's Hearthstone tavern brawl is one that we've seen quite a few times in the past: Encounter at The Crossroads. What is new is that instead of rewarding players with the standard Classic pack of cards, you'll get a Journey to Un'Goro pack. 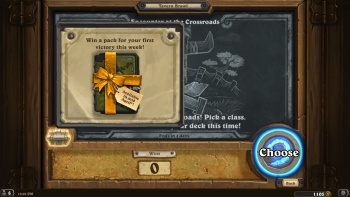 Now, as Journey to Un'Goro doesn't actually release until April, you won't be able to open the free pack from the brawl until then. It will simply sit in your account, just like the pre-order packs do. In other, somewhat related Hearthstone news, Peter Whalen and Day will be streaming card reveals starting at 11 AM PDT on the PlayHearthstone Twitch channel. Many are assuming that it will simply be some card reveals, but others think it may be something even bigger. Given that we still have two weeks until April, it seems strange to have this brawl with the free Un'Goro pack drop this week, so one theory is that Blizzard is just going to drop the expansion on us early. If you're not familiar with the Encounter at The Crossroads brawl, players choose their class and are given a deck of random cards - 15 class cards and 15 neutrals. There's a slight twist this week, as 4-mana 3/5 "Party Crashers" which have Taunt and attack automatically attack your opponent's face will periodically spawn for each player.